BAYER has long had its sights set on public schools. BAYER subsidiary CURRENTA has now gone one step further with its gift of a specially produced hidden object book for kindergartens in the communities where it has sites. A blatant attack on the minds of the very young. Large companies are increasingly targeting children and adolescents. For example, the company BAYER operates a mobile chemistry laboratory “to make the subject more appealing” to young people. BAYER also offers training days for teachers and teaching materials free of charge, especially concerning controversial subjects such as bee mortality and genetic engineering. Each year, the company distributes about half a million euros to schools close to its sites. BAYER subsidiary CURRENTA has now gone one step further and has extended its marketing to young children. 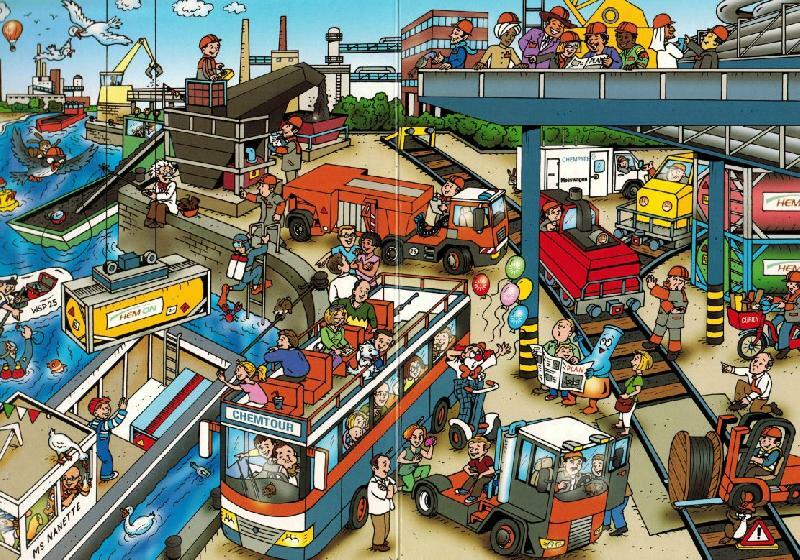 The company commissioned an illustrator to produce a hidden object book depicting the cheerful hustle and bustle of a chemicals factory: crane drivers, divers, visitors from all over the world, clowns and colourful balloons (see details). CURRENTA is currently distributing the book in the vicinity of the German BAYER sites. For example, the book was given to kindergartens at Christmas. Philipp Mimkes from the Coalition against Bayer Dangers: “It is a scandal that CURRENTA and BAYER are invading the sheltered kindergarten environment. Young children cannot understand the risks of chemical factories and are defenseless against this corporate propaganda. We´re demanding an effective ban on all forms of advertising in educational establishments.” The Coalition has introduced a countermotion to the upcoming BAYER shareholder meeting. Across Germany, educational establishments are increasingly being used for opinion-making. Service providers like the Deutsche Schulmarketing Agentur, an agency which by its own admission “aims to align the economic interests of commercial companies with educational establishments” shamelessly promotes the commercialization of teaching content. Values such as independent opinion or critical abilities are thus being undermined. Bayer Science, a global biotech company, values the importance of children. Now their subsidiary Currenta is gifting a specially produced hidden object book titled Max and Marie Visit the Chemical Industry. Is this a blatant strategy on the minds of the young? Currenta commissioned an illustrator to portray the chemical company as a cheerful place with crane drivers, visitors from all over the world, clowns, and colorful balloons. They’ve been distributing the book to schools located near the chempark sites in Leverkusen, Dormagen, and Krefeld-Uerdingen, Germany. For example, they gave the book to kindergartners at Christmas. Additionally, in the past years, Currenta has organized projects for elementary schools near the vicinity of Bayer’s sites. Bayer, as mentioned, has specifically targeted children in the past. For instance, they operate a mobile chemistry laboratory “to make the subject more appealing” to young people. Bayer also offers training days for teachers and publication materials free of charge. These promotions cover controversial subjects such as bee mortality and genetic engineering. For instance, they released a children’s book titled Toby and the Bees to spread misinformation with regard to why bees are dying. In this children’s book, the friendly neighborhood beekeeper tells “Toby” that the bees are getting sick, but “not to worry” — it’s just a problem with mites, he says. There’s no mention of systemic pesticides tied to the global bee die-off. At present there have been numerous studies revealing that neonicotinoids attack a bee’s nervous system. Furthermore, low levels of exposure have been shown to disrupt foraging abilities, navigation, learning, communication, memory, and suppress the immune systems of bees; making them more vulnerable to disease and pests. The Coalition has introduced a counter-motion to the upcoming Bayer shareholder meeting. Norbert Hocke, a member of the board of the German Education Union (GEW) also criticized Bayer’s marketing.